Beautiful, Beautiful Bacon – Eat Me. Drink Me. Like a hazy summer morning on the East coast. Without bacon there is no baked beans, there is no avocado sandwich, there are no dates wrapped in bacon blankets set on a plate in a restaurant in Seville, next to tiny octopi in oil, olives, and chopitos. Bacon is the what I make for you because I like you and the what you make for me because you like me. It’s also the what I make for myself when no one’s looking. Germany, oh land of beers and brats, oh land of cheeses and sausages, spätzle and baked breads – what I wouldn’t give for bacon. So bacon isn’t Speck? Oh the things I have to learn about food.. I was just thinking about that time I visited you in Pennsylvania. It was the summer we graduated, and I was heading north for a teaching job. I remember biking with your dad over grassy streams and dense forests to Dickinson College, and floating down that river, a beer in one hand and a paddle in the other. I remember making pancakes and bacon in your kitchen, and having a heated conversation re: crispy vs. chewy bacon. I think you won the discussion because we ate our bacon chewy that morning. We sat out in your backyard over cups of coffee, chatting about Davidson and about was next, and what wasn’t. I lost track of the time and lingered too long, putting off the last stretch of my drive north. When I finally looked at my watch, it was almost noon, and I had to run, speeding up I-81 towards a turn in my life. PS there’s no bacon here in South Africa. It makes me very sad. 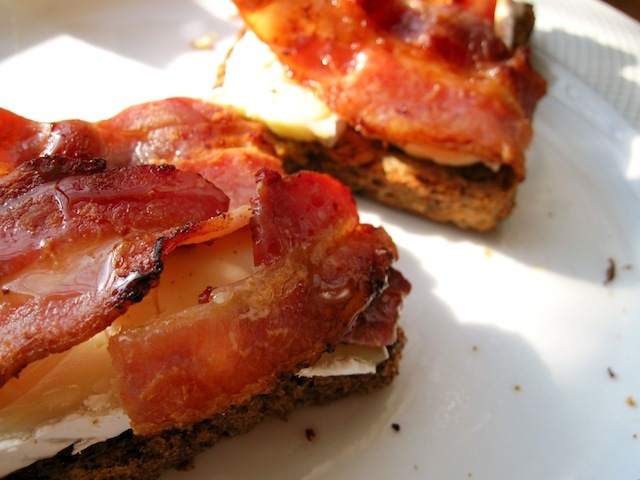 PPS did you know bacon contains a chemical that has been shown to effectively mitigate the effects of hangovers? Come to Berlin. We’ll drink beer by the water and talk about life. And we will find bacon somewhere in this country, and have it for breakfast for our hangovers. Sorry to tell you but we about a packet of bacon a week here in VA. Cook it to perfection and add a little brown sugar right before we take it off the stove – just to glaze the hot crispy slices of thick cut bacon. The grease is also good to pour over fresh spinach after you add a little vinegar it…like a sweet and sour mix. Oh, but try making that b(elly)a(avocado)tomato sandwich! Just slice the pork belly thinly into strips, sprinkle with a little salt and pepper and bake at 375 until halfway cooked, then sprinkle with brown sugar (or drizzle with agave nectar if you’re avoiding sugar the way I am) and continue to bake in the oven at 375 until crispily delicious and glazed. It’s bacon gone to heaven. Lyz, this is a wonderful post! I love the how many different aspects of bacon you mention. I am doing an independent study with Professor Gibson this semester. We have read some great books and I created a food blog as well. http://pleasuresofthetable.wordpress.com/ You were our inspiration!! this should be framed and hung up in every kitchen. bacon is the best. What poor life without bacon…. Hope you find some until July! Whaaaaaat? All these years here and that what I eat is no bacon? My world is slowly cracking… guess I´ll find out what bacon really is next September, when I go the USA – that is, if they have real bacon in Montana.